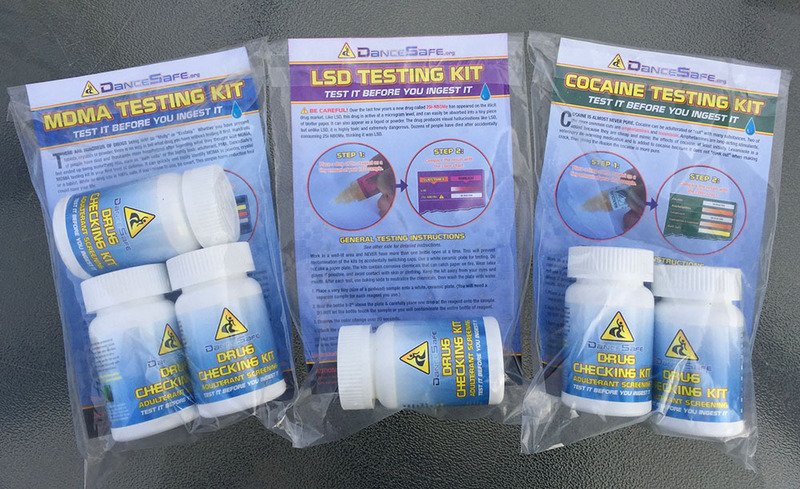 DanceSafe’s fentanyl testing strips use immunoassay technology to quickly and reliably detect the presence of fentanyl and many of its known analogs in a drug sample. Fentanyl and its analogs are highly potent synthetic opioids largely responsible for a dramatic increase in heroin-related fatalities. They have also been found in counterfeit pharmaceutical pills as well as cocaine and other drugs. READ THIS FIRST! —> This page contains all the instructions for using the strips. Please read everything on this page twice before using the strips. It is important you understand what fentanyl is, why it is so dangerous, and the limitations of the strips. USING THESE STRIPS DOES NOT GUARANTEE SAFETY! No drug use is 100% safe! Fentanyl and various fentanyl analogs are highly potent synthetic opioids between fifty and many hundreds of times stronger than heroin. They are primarily responsible for the twenty-fold increase in heroin-related fatalities since 2013. Many people have also died after consuming counterfeit pharmaceutical pills containing fentanyl, and more recently, fentanyl-laced cocaine, meth and other drugs have begun killing people. * Note: The term “fentanyl” refers to fentanyl itself, as well as numerous analogs such as acetyl-fentanyl, furanyl-fentanyl, carfentanil, and others. Some analogs, such as carfentanil, are so strong that a fatal dose may be invisible to the naked eye. Fatal doses: Fentanyl and its analogs are so powerful a fatal dose may be invisible to the naked eye. WARNING! 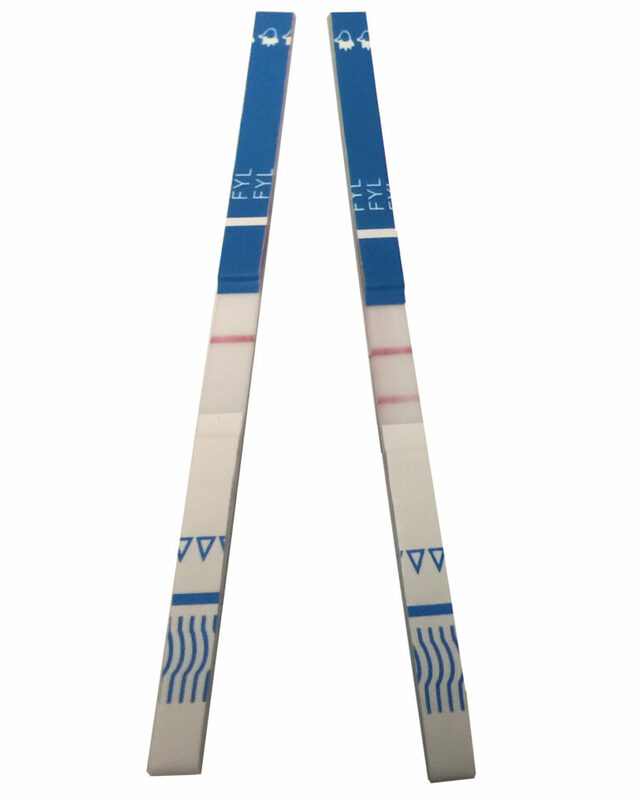 Fentanyl test strips from other sources may not work the same, and some may not work at all. In conjunction with the University of California San Francisco, we tested five different strips from three different manufacturers. Four did not detect carfentanil, and one set of strips from a Chinese manufacturer did not work at all! For media and other inquires about our fentanyl test strip study, please contact Emanuel Sferios. 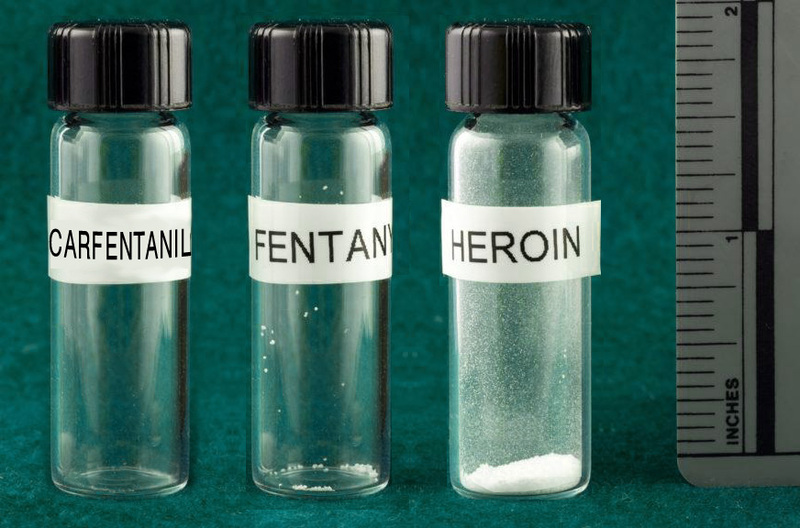 When fentanyl (or a fentanyl analog) is mixed with heroin, cocaine or other drugs, it is *never* mixed evenly. Powder from one side of a baggie (or on the edge of a pressed tablet) may contain no fentanyl at all, yet powder from the other side may contain a fatal dose. This is called the “chocolate chip cookie effect” and is why it is important to test every bit of the drug you intend to consume! If you inject heroin or other drugs, you should really test every time you inject. The best method is to test the residue from your spoon or cooker. After preparing your shot, set the needle aside and wait to inject. Add about 1 milliliter (about 1/4 of a teaspoon) of clean water into the spoon or cooker. 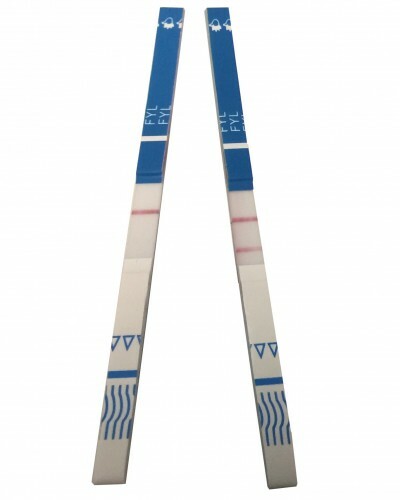 Hold the blue end of the test strip and insert the other end into the liquid. Set the strip down on a flat surface and wait about two minutes. See “Interpreting the results” below. The best method for testing powders, crystals or tablets is to test every bit you intend to consume. This requires dissolving you entire dose in water, which means you will need to drink your dose if you decide to take it. For drugs like cocaine or meth that many people like to snort, drinking it will still work. It will take longer to feel the effects, but they will last longer. Add water• If you are testing methamphetamine or MDMA, add one teaspoon of water (about 5ml) for each 10mg of crystal or powder you are testing. It is important to get this ratio correct because meth and MDMA give false positives if too concentrated. Specifically, you need to dilute meth down to about 2mg/ml, but not too much more than that. This is about one teaspoon for every 10mg. This method will avoid false positives yet still be able to detect a fatal dose of fentanyl, carfentanil and most other fentanyl analogs.• If you are testing cocaine or any drug other than meth, add two teaspoons of water per 100mg of powder. This is approximately 10mg/ml, an ideal dilution to detect fentanyl and most of its analogs in powdered drugs. Method #2 – Testing the residue inside your baggie. CAUTION! This is NOT the recommended method for testing. The best method is to test every bit you intend to consume, as described above. However, some people may not be willing to dissolve their entire dose of drugs in water every time they partake. In that case, the next best method is to test the residue stuck to the inside of the baggie the drugs came in. This method may not detect fentanyl due to the chocolate chip cookie effect, but it is better than not testing at all. Put about half a teaspoon (about 2.5ml) of water into the baggie and swish it around to dissolve the residue.• If you are testing methamphetamine or MDMA, you may need to add more water depending on how much residue is stuck to the inside of the baggie. Dilute down to at least 2mg/ml to avoid false positives. So if you think there is more than 4mg of residue in the baggie, you may need to add an entire teaspoon of water (5ml) or even more. 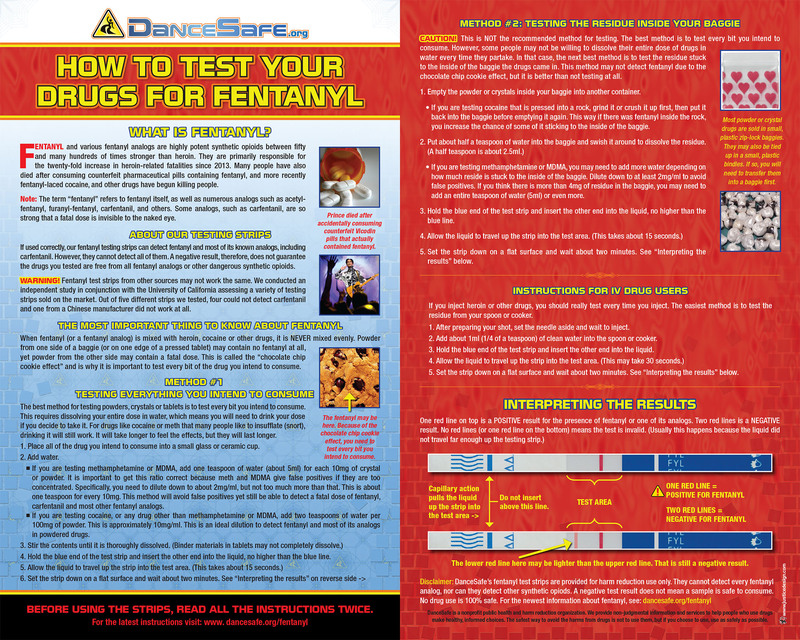 Disclaimer: DanceSafe’s fentanyl test strips are provided for harm reduction use only. They cannot detect every fentanyl analog, nor can they detect other synthetic opiates. A negative test result does not mean a sample is safe to consume. No drug use is 100% safe. All drug use contains inherent risks.